My last post really had me thinking about all of the crochet poo I have managed to create during my short, yet ongoing, reign as Crochet Queen of the World. (What?!? Megalomaniac?!? Moi???). Oh yes, my friends. In my first overeager attempts to jump right in with hooks a-blazin', I left quite a shameful trail of what-not-to-crochet behind me. It all began with my first choice of yarn. I had my Teach Yourself to Crochet materials all laid out and ready to go- all I needed was some beautiful yarn to transform into a wondrous work of crochet excellence that would have family and friends marveling at my utter artistic brilliance. So, what do I choose? Hmmm..... Well, let's see.....I love purple. 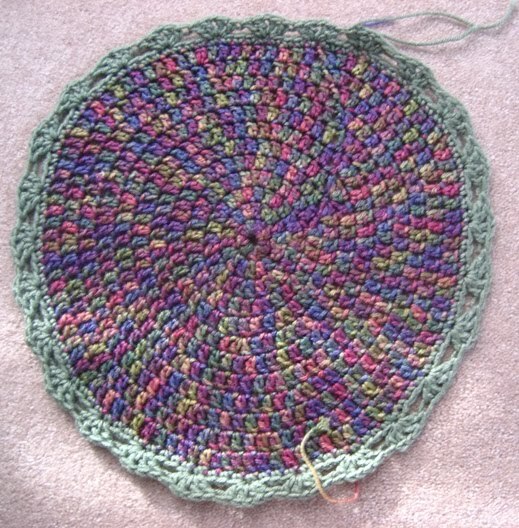 If it is purple, it is beautiful and will make beautiful crochet pieces of art. 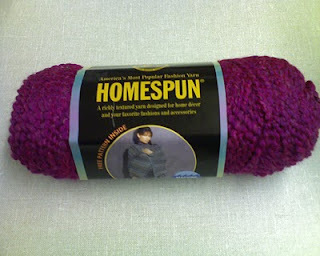 Even if it's Homespun yarn by Lion Brand- it's purple, so I must love it and buy it NOW. Lesson Numero Uno- NEVER buy Homespun yarn. Ever. Especially if you are a beginner who has never picked up a hook before. Never. As I learned the hard way, you will never be able to see your stitches. I thought I was a crochet 'tard when I couldn't figure out which loop the instructions were talking about- there was nothing but loops in this yarn. This was a serious blow to my Queendom aspirations. When I figured out that Homespun was not the best yarn with which to learn crochet, I went back to the store and found RHSS- a great yarn with which to learn. 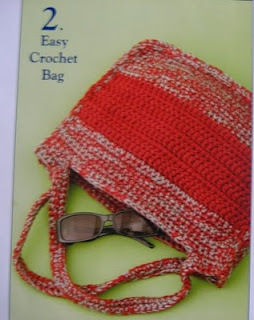 After learning the basic crochet stitches, I decided to work on a purse that was in my Crochet learning packet. (Makes sense that I make many purses now- I was drawn to purses from the very get go.) This is what it looked like in the book. Cute, huh? It was made with two strands held together- sc for the two colors mixed, dc with the main color in the middle. Well, when I first bought that RHSS, what did my lustful eyes draw me to? Oh look! More pretty purple! Mixed with other pretty colors! And here's another one that's pretty blue with some pretty purple in it! Look at the pretties! 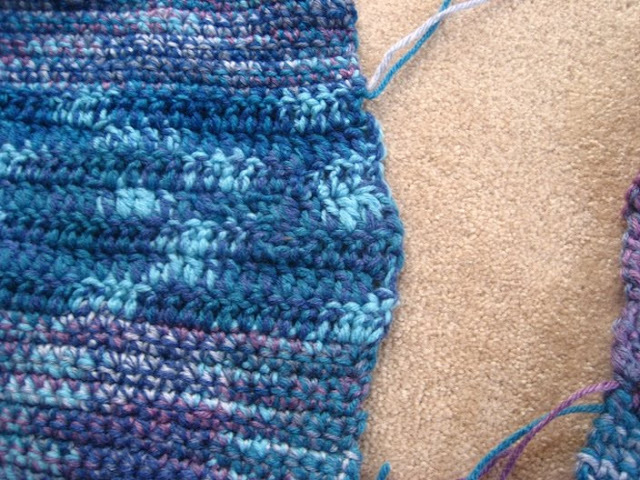 Oh yes- I discovered variegated yarn and it was my new favorite. It was so bad that I couldn't even finish it. Here you can see my early attempts (and subsequent failures) at getting dc even at the end of a row. 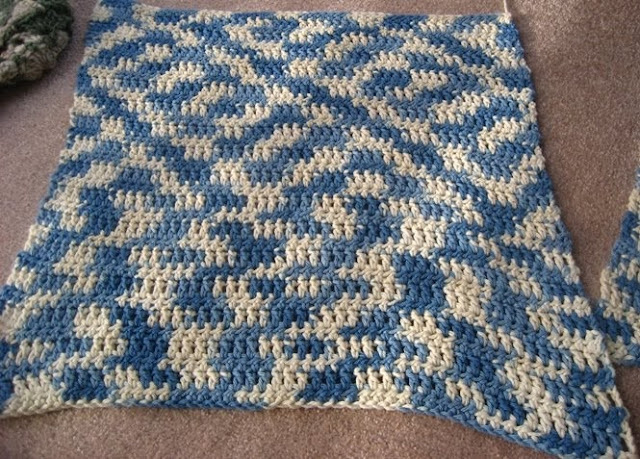 For my second project, I surfed for free projects and found one on the Michaels website for another purse. It was made of motifs that you join as you go. Since I was tricked by purple last time, I decided to go a more neutral route with this project. It actually didn't turn out that bad. I actually finished it in record time and was oh so proud of myself and couldn't wait to utilize my new handmade bag. Ummm....yeah. Do you see all the ends sticking out? 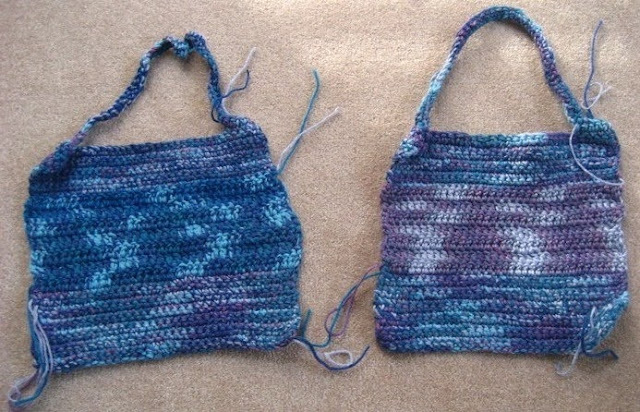 With this bag, I found that I don't like weaving in ends. Lesson Numero Tres- if you don't like weaving in ends, don't make something that will have a million of them for your second project. Also, since it was so holey and stretchy, it is a very impractical bag. I may line it in the future just so that it won't sit in my pile-o-shame any longer. But, until then, shame pile it is. I think after these 2 projects, I was a little disheartened, so I put crochet away for a month or so. However, those hooks kept luring me back, so I decided to try it again. This time I promised to learn from my mistakes. 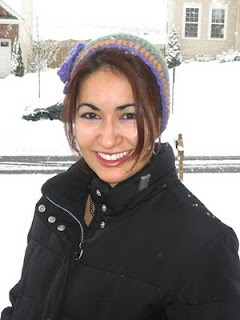 I decided to try a hat and found really cute ones at Yarncat. I taught myself how to crochet in the round with this hat. Then I made a scarf to go with it. 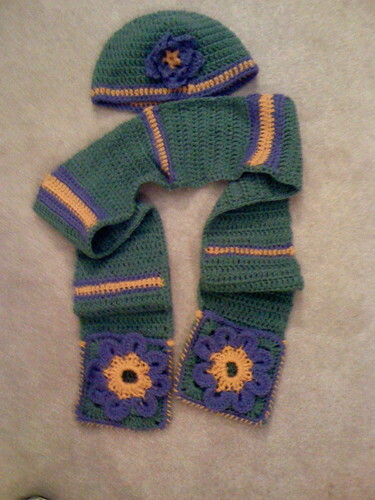 I started with a flower I found in one of my crochet books and then designed the scarf to go with it, making the flower into a pocket. This is my first attempt at designing. I actually do use these and I made my sister a matching set in pink. Crochet Queendom attained. Not bad for a first hat. Feeling very proud of how quickly I learned from my mistakes, I moved on to my second hat. I found another free pattern for a cute cloche and thought, I am the Crochet Queen and this shall be my crown. The pattern called for bulky yarn, so I thought, Homespun is pretty bulky....hmmmm.....*strokes chin*......let's try it again!!!! 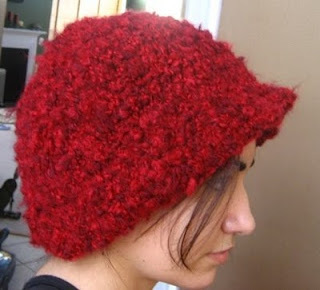 Here is my second hat, or as I lovingly call it, the Head Eating Blood Clot. It's HUUUUGE. 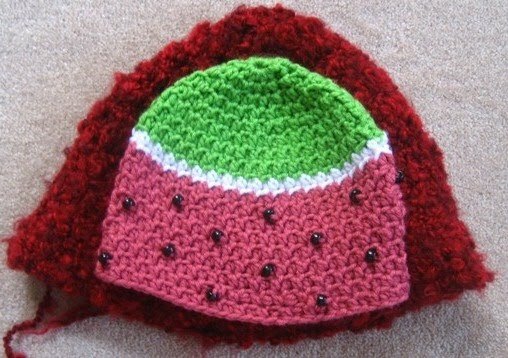 Here it is in comparison to my watermelon hat. Just so you don't think it's a trick of the camera, here is the Blood Clot eating my watermelon hat. Since this didn't lay flat, I thought, no problem! Just iron it. RHSS. Acrylic. Good idea, no? Lesson Numero Cinco- ACRYLIC MELTS. Do not use it for anything that will come in contact with heat or you may have an ugly variegated puke stain to clean up later. Well, now I thought that I learned all I could from acrylic yarn and should now branch out and try new fibers with my supremely advanced crocheting abilities. I'd been eyeballing those large cones of cotton at Walmart for a while, so I thought, why not! I'm Queen. Give it to me now! I didn't know what to make with it, but thought another bag would be nice. I think this one came from the Sugar and Cream website. 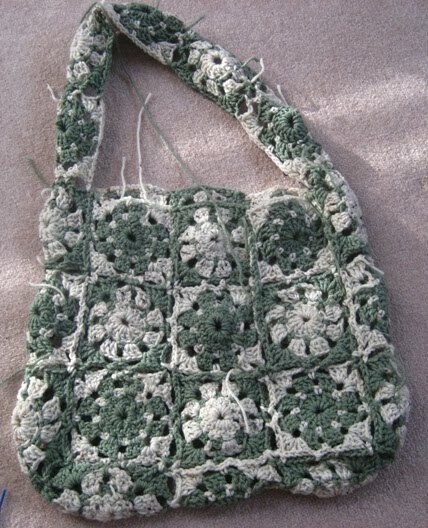 It's supposed to be a market bag- not only was I going to make a crochet work of art, I was going to save the planet by taking my reusable, handmade, environmentally friendly bag with me and not use disgusting non-biodegradable plastic anymore. I snatched the crown off of the Environmental Queen's head, as well. It was easy- just sicced my Blood Clot on her and her kingdom was mine. REALLY?!? Self! Did I not tell you to memorize Lesson Numero Dos???? What do I have to do to you to make you understand??? As you can see, I did not finish this one, either. I think I got disheartened by the ugliness of it all. I couldn't picture going into Trader Joes trying to impress folks with my reusable, handmade, environmentally friendly turd bag. Nope. Couldn't do it. So there you have it. A sampling of the wondrous poo that can be created with hook and yarn. Ahhhh....memories. Sooo glad I didn't do something embarrassing to give crochet a bad name. Whew! Crochet Queen status secured. Crown firmly in place. Actually, I don't think I could take it off if I tried. No, seriously. A little help here? Joycers- I'm glad I'm not the only one with a crochet pile-o-shame. :) I must have been very stubborn to try and continue to crochet after my very disastrous beginnings. Sivi- I know, right? I do still have that first ball of yarn sitting around somewhere. It's still oh so pretty, but I'm so afraid to touch it! You've come a long way, baby!!!! I laughed at your post...we've all been there. I can honestly say your skills have come a long way in a short time. There's a mario contest going on right now. Maybe you can enter since you have a lot of mario items. I don't think your first projects were all that bad, for a beginner. I actually like some of my first projects, although I did/have improved more as I'm getting more experience. I need actually to start challenging myself more. But, that needs time, which I don't always have(family!!). Anon- I was actually impressed with myself at how quickly I was able to churn out those stitches. Once I figured out that all purples are not created equal (and that variegated yarn is not always my friend) I think things started going uphill. ;) Totally agree with you on the time thing....daylight savings time doesn't exactly help. I lost an hour! BUT gained more sunshine- love that big ball of hot gas out there and really missed it this winter!